I'm a competitive person. Now for most things I'm gracious and helpful, but if it comes to games or my husband: I will win. 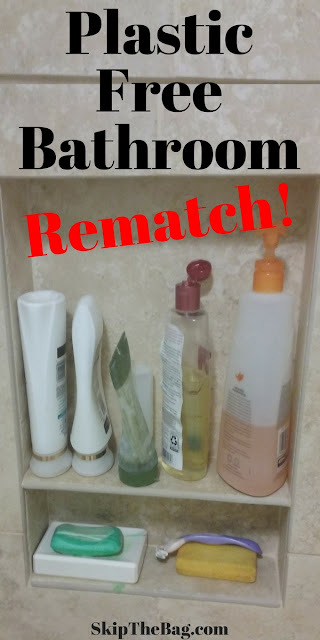 So needless to say when I discovered a year ago that his bathroom routine created less waste than mine I knew some changes needed to be made. I'm not one to throw out perfectly good stuff so I knew there would be a transition period, but I figured that would just give me more time to research and prepare. So the fact that it's taken me a year to get where I'm comfortable in my routine and to compare us again is not a surprise. I'm roughly where I was 3 months ago anyway. I have not specifically gone over this list, so I hope I've made improvements and am not missing something huge. Let's get the competition going and see what the standings are now! 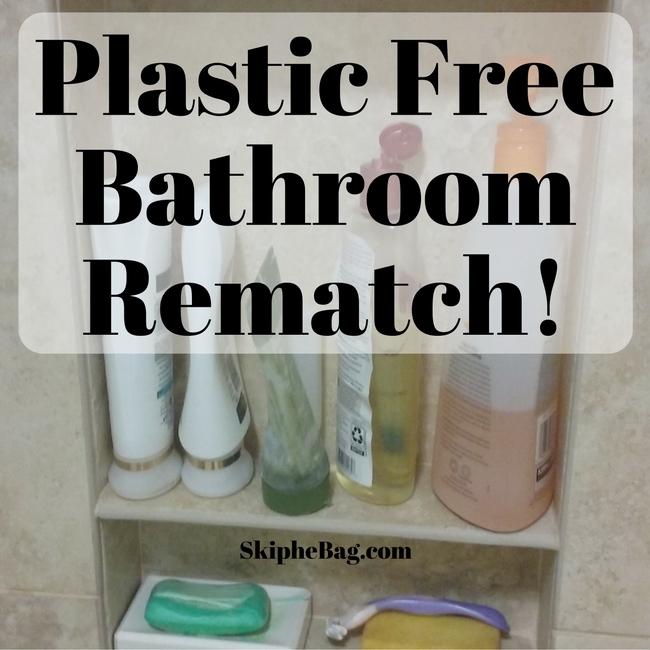 Shampoo and conditioner is one spot that is really easy to cut down on your plastic use and waste. There are a lot of ways of going zero waste (or low waste) with your shampoo and conditioner. 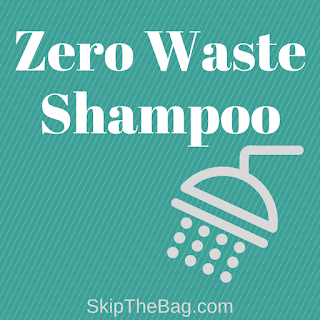 In fact, I wrote a post about 6 zero waste shampoo methods. Hubby does no shampoo, he just simply goes without and just rinses his hair with water. I use a shampoo bar. After figuring out some tricks on how to use the shampoo bar, I've been really liking it. I guess it technically creates minimally more waste than him (the paper around the shampoo bar), but I'm calling this one a wash (ha, ha,ha). Hubby also doesn't use conditioner and while I tried a conditioner bar, I quickly learned it wasn't for me. Since then I've been using Plaine Products conditioner and this creates no waste for me as I can ship back the containers and they will refill them before recycling them. Hubby has been using bar soap all along and now I do too! No more loofah and body wash for me. I went to a CVS and the only bar soap available without plastic was on clearance so I saved the earth and my pocketbook all at the same time. 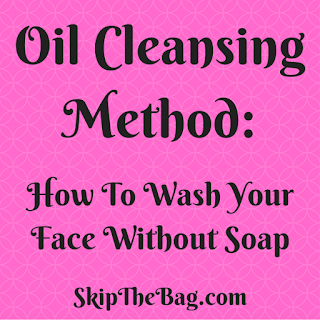 I have noticed that my skin may be a little dryer or not quite as exfoliated as when I was using a loofah so I'm tempted to exfoliate with my mixture of olive oil and sugar or salt. I tried Hubby's short handled razor for one shave and immediately knew I wanted the long handled safety razor. I think safety razors are great and wonder why people are afraid of them! Thinking about getting your own safety razor? Learn more here. 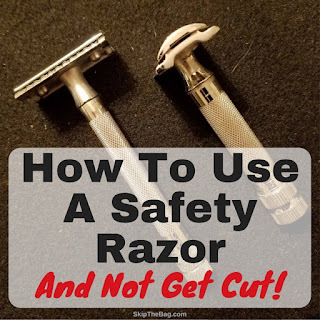 After using mine for a while I wrote this post about how to use a safety razor and not get cut. Update: I just got a new razor which I love! Check out my review of the razor and why it's so good. Hubby, naturally, does not use these products, but I do still use them in a regular basis. I've just run out of my face powder and I'm considering subbing it with corn starch and cocoa powder, but haven't quite made the leap yet. Update: I've made the leap and it's awesome! Still doing ok on this front. I'm enjoying using coconut oil, although another oil might be better. Hubby still doesn't use this so I'm going to call it a tie. Both of us were using plastic brushes with plastic brushes. We've since converted to bamboo and it's great. I've found that I go through the bamboo toothbrushes more quickly than Hubby because I apparently push really hard while brushing and the bristles get bent quickly. This probably happened with plastic toothbrushes I just didn't notice. I'm so proud of how far I've come. I was failing miserably a year ago, but now I've pretty much tied it up. In fact we've both improved since we now are using bamboo toothbrushes. There are still improvements to be made (like makeup), but I'm just happy that we are reducing our impact on the environment. I guess a little competition is a good thing! So how do you stack up? Sign up for the newsletter to keep up on all the changes we make. Did you know yoy can grow your own loofahs and still get a compostable, basically free, exfoliation? They grow like cucumber, and the smaller ones you can even eat! Yes, I've been meaning to get some seeds to grow them. I would love to grow my own. I had no idea they were edible though. Crazy! 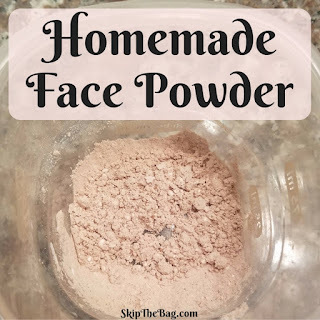 I would definitely recommend using cocoa powder and corn starch as a makeup replacement! I love it and it's super easy and cheap too! What shampoo bar do you use? I love J.R.Rigglets brand but just found a local one made in my town! Yay, thanks for the recommendation. I'm going to do it tomorrow as long as I still have some cocoa powder in the kitchen. I use J.R. Liggett’s. and have had great success with that. I have yet to find someone who makes it locally, but I keep asking! I really like that you compared your new and improved routine to the one you had a year ago. It's always good to double check ourselves and hold ourselves to a higher standard. I also think it's great that you're competitive with your husband. I haven't made the switch over to cocoa powder but when you do, please let me know how it goes. I'm still very curious about it. Great job though! your new routine sounds VERY minimal! I'm impressed! I will be sure and keep you posted on the cocoa powder foundation. There are still places I need to go, but it's been fun to see how far I've come! I use coconut oil as a moisturizer all over my body and use it from the jar I buy at Costco in extra large container. I put it in a old egg cooker that I no longer used in my shower stall to put on after I shower. I do skin brushing daily be showering so I don't need to exofiate with any other product. The skin brushes last a long time if you take care of them and mind have the bamboo handles. Thanks for your tips. Pinned & tweeted. 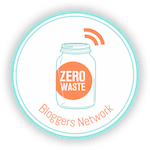 Visiting from #WasteLessWednesday blog hop. Have a healthy, happy & blessed week. I've heard good things about skin brushing, but I've yet to try it. I feel like I'd like it! Thanks for the suggestion. I use the conditioner, but they make a refillable shampoo and body wash too! Win, win, win! I am really curious about the shampoo bar and would like to give this a try. I've never even heard of these! I love using shampoo bars! You can read my review here. This is a great post! I think we are all competitive (hopefully in the healthy sense) with out significant others. :] My husband and I are currently in a competition to lose weight, ha! Are there color-safe shampoos out there with refillable bottles? I currently have purple hair and need all the help I can get to keep it, ha! Wow! I never even thought about some of these options before! Thanks! I especially like the bamboo toothbrush idea. I've never even heard of such a thing! Great information! Thank you! 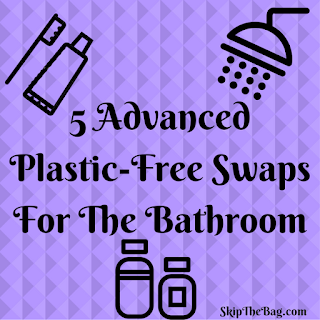 I didn't know about most of these before I started my zero waste journey either. There are so many great options to discover that are great for the environment. I think my husband and I would be pretty even. But I will have a little competition like you and see how we go! For your exfoliation issue have you considered body brushing? They are wooden so can be composted when they no longer work although saying that I've had mine for over 10 years and it's still going strong. Someone else just mentioned body brushing too. I've heard of it, but never really looked into it. I guess I should! I use Earth's Daughter's toothbrush and Merkur razors. I for some reason love using the soap, but I never thought that I am doing a good thing with that :) and to be honest I never thought about some of the options that you mentioned here. Anytime you are forgoing plastic you are making an impact! I can't wait to hear if you make any other changes. I am getting there in the bathroom but I still need to find a hard enough bamboo toothbrush to suit my teeth .. but love my shampoo bar and soap .... no plastic waste and no palm oil.